Grandpa Matt with a “knipboomed” pear tree that will be available for spring shipping. Pears are very popular with many of Grandpa’s customers, but growing a good pear tree in the nursery can be more challenging than you think. Although many of the sources that Grandpa uses for pear trees grow an excellent one-year-old tree, they never seem to have as much branching as customers want. That is because in most fruit tree nurseries, pear trees just will not make many branches in the first year. Pears trees in general are quite upright growers in the orchard, and as young trees just are hesitant to make very many limbs until they get older. So, most of the one-year-old pear trees that Grandpa’s Orchard offer have good caliper, but few limbs. Some varieties do limb better, but in general the majority of pear varieties will often be “whips” which have few if any limbs that one would want to keep after planting. In order to get better limbing on pear trees, the tree must be headed so that the buds under the heading cut can break dormancy and grow into limbs. When we pack and ship one-year trees, we already do the heading cut for you in order to make it fit into the box. Sometimes, you may want to re-head the young tree after planting in order to encourage a different bud to grow based on your preference. 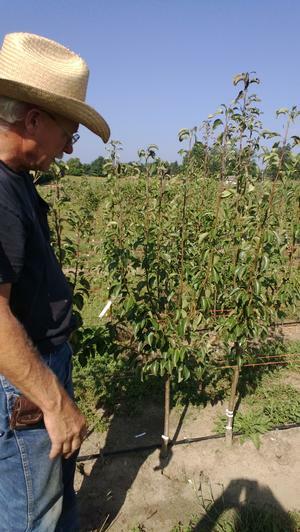 Typically, the two-year-old trees that Grandpa’s Orchard offers will have more limbs, because we treat them in the field to encourage more and better limbing. Even then, there can be big differences between varieties based on their individual growth characteristics. Almost all of the semi-dwarf pear trees on OHxF 333 rootstock that Grandpa offers are grown in our own nursery, as well as many of the harder to find heirloom and hardy varieties. While Grandpa can grow a nice one-year tree, he has switched to growing what is called a two-year “knipboom” tree. “Knipbooming” was developed by Dutch nurserymen, hence the name. Instead of harvesting his one-year trees in the fall, Grandpa will leave them in the field and will head the tree back early the next spring. A new leader will develop as well as many branches below the cut. As you can see by the picture, most trees will have many more limbs for the backyard grower to choose from when he plants and trains his tree. Another benefit is that the caliper of the tree increases. Look for these trees to be available for spring planting only. It is not possible for us to offer them for fall planting due to constraints on digging to order as well as making sure they are properly hardened off. Knipbooming can be done to apples as well, and Grandpa will be switching to this method for many apple trees too. Learn more: Chilling hour requirements for pears.